Home agriculture Cooperative extension farm farm business penn state pricing promotion small business Promo Prices--When is Enough Enough? Promo Prices--When is Enough Enough? Everyone loves a sale, right? 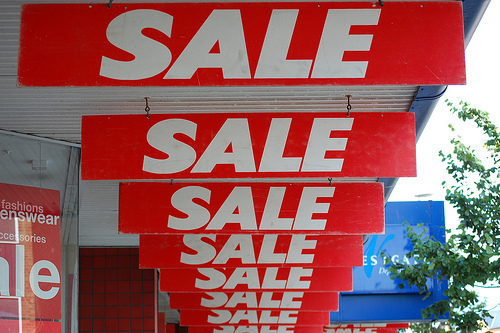 This might be your strategy for getting customers into your store, but can you have too many promotions? In a Supermarket Guru article from earlier this year, frequent promotions and more consistent pricing strategies are explored. Seventy-six percent of retailers are sending more price changes to stores in 2012 as compared to 2011 shows research from Retail Systems Research (RSR). With these numerous price changes, it seems retailers are promoting a hyper-promotional environment. Increased price sensitivity of consumers (67%, up from 58% in 2011 and 46% in 2010). Increased pricing aggressiveness from competitors (51%, up from 48% in 2011 and 38% in 2010). Increased price transparency—the impact of comparative price shopping (47%, up from 40% in 2011 and 11% in 2010). Need to protect our brand’s price image (42%, up from 38% in 2011 and 28% in 2010). Need to provide consistency in price across channels (27%, down from 32% in 2011 but up from 6% in 2010). One outcome the article describes is that " 41% of retailer executives surveyed say their companies have become more promotions-driven in 2012, up from 31% who said this in 2010; only 12% focus more on everyday low prices, the findings show...Yet among retail winners (with comp-store sales growth in excess of 3% annually, says RSR), the simple discounting of high-low pricing (38%) and Everyday Low Pricing (25%) are the primary pricing levers. Only retailers classified as losers (annual comp-store sales growth under 3%) used a hyper-promotional strategy (18%)." The survey didn't explore beyond pricing and promotions, so a hyper-promotional strategy isn't the only reason these stores might be considered "losers". It is also important to think about what services, assortments, convenience, and expertise your store offers. Learn more about the 4 P's (Pricing, Promotion, Product, and Placement) in the Resource Center of PAMarketMaker.com or in the Value-Added Marketing Series section of the Penn State Farm Business Management page. As an agricultural entrepreneur, do you run promotions? How often? How do your customers respond to promotions?